Moonyoonooka Station farm manager Ken Thompson managed a solid return from his canola and wheat crops despite contending with outbreaks of sclerotonia, high levels of aphid activity and a persistent ryegrass problem during WA’s 2013 winter. While they had a successful wheat crop, the canola returns were generally disappointing district-wide. However, they were still able to have a great result during a high disease incidence year. The grower sowed four canola varieties and two wheat varieties after opening rains of 65mm in May. May ended on 120mm followed by a disappointing June fall of 14mm, with Moonyoonooka finishing the year on 410mm. Mr Thompson reported a yield of 3t/ha for the wheat crop, which was the average across 1000ha sown. For canola, the highest performing variety was Hyola 404RR, which yielded 1.3t/ha with oil up to 46.7 per cent. The Hyola 555TT yielded 1.3t/ha with an oil content of 41.6 per cent, while Hyola 559TT in the same paddock had an identical yield of 1.3t/ha, but with a much higher oil percentage of 46.2. The ATR Cobbler yielded 0.9t/ha with oil at 43 per cent. Mr Thompson sowed the canola on 12-inch spacings at 3kg/ha on May 9, banded with 60kg Mallee Extra fertiliser (14.9N, 12.0P, 11.3S, 0.1Cu, 0.2Zn). The canola was treated with Atrazine (TTs and OP only) and insecticide early in the season and topdressed with 130kg of NS31 (32.6N, 0.8P, 10.9S) in June and then 50L/ha of Flexi N in July. Herbicides were then applied on June 4, including Atrazine (TTs and OP) at 1.6L/ha, Clethodim at 500ml/ha and 60g/ha Lontrel plus Uptake oil; added to the mix were selective insecticides Alphacypermethrin at 200mL/ha and Chlorpyriphos at 100mL/ha. In August and September, both Prosaro fungicide and additional insecticides were applied to prevent or control further insect and disease incidence. Later in the growing season, a five-week holiday abroad was all it took for aphids to start damaging crops, due to 105mm of rain in August. The huge amounts of aphids had to be sprayed twice with Alphacypermethrin and Chlorpyriphos. In the current season, they plan to carry out ground sprays to minimise aphid damage. A persistent ryegrass problem also became apparent in Mr Thompson’s Hyola 404RR Roundup Ready hybrid so he used two applications of Roundup Ready granules to quash it. 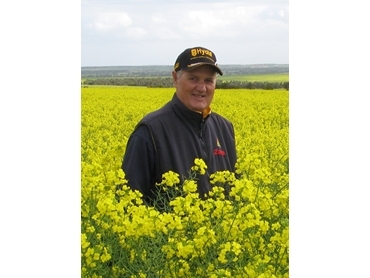 He spoke to Pacific Seeds canola technical manager Justin Kudnig seeking real solutions for residual weed control later in crop development. Harvesting took place on November 2 and 3 using direct heading and they had to desiccate the crop at that point with Reglone 1.2L/ha because of late rain causing a large amount of green weed undergrowth. For the winter crop season ahead, Mr Thompson plans on sowing just one canola variety, the Hyola 404RR, due to its high early vigour, ability to handle weeds and proven track record for profitability in his area. Pacific Seeds is committed to bringing the best plant genetics and seed technology to Australia’s farming community.